Oscar A. Kirkham was born in Lehi, Utah, on January 22, 1880, to James Kirkham and his wife, Mary Mercer. James was a farmer, storekeeper, and tithing clerk. 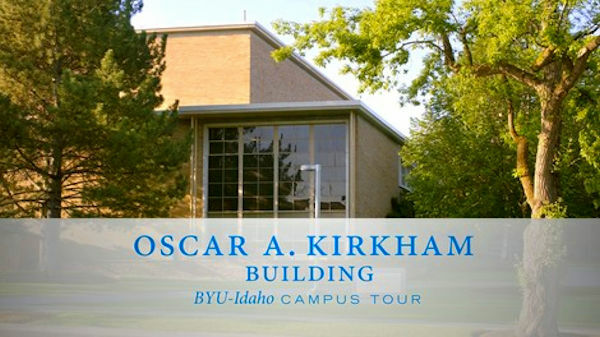 Oscar Kirkham was the younger brother of prominent educator and Book of Mormon scholar Francis W. Kirkham. Oscar A. Kirkham's first job was at Ricks Academy in Rexburg, Idaho, where he taught music from 1903-1906. At the age of 25 Oscar Kirkham was ordained a Seventy by Joseph W. McMurrin on February 26, 1905. After serving as a Mormon missionary in Germany and graduating from Brigham Young Academy, Kirkham studied music in Germany and then taught at the Latter-day Saints University. In 1913 at the age of 33 Kirkham was appointed Traveling Secretary of the LDS Church's Young Men's Mutual Improvement Association (YMMIA) to oversee recreational activities. He later served for many years as Executive Secretary of the YMMIA. 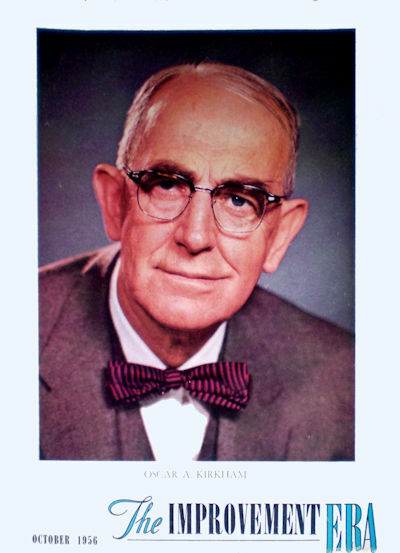 Oscar Kirkham was involved with the Boy Scouts of America at a high level. For example, he served as a Regional Scout Executive and on the U.S. National Staff at the 1929 International Jamboree at Arrowe Park in Birkenhead, England, where he was in charge of the religious exercises of the American scouts. 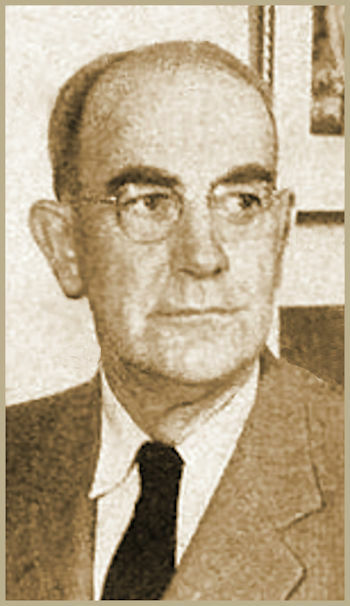 President Grant installed Oscar Kirkham as one of the Seven Presidents of the Seventy on October 5, 1941. Elder Marion D. Hanks had Kirkham's personal notes published as a book Say the Good Word, to which Hanks wrote the forward. After having taught music at Ricks Academy in Rexburg, Idaho, early in his career, Kirkham was later honored with a building named after him on the campus of Ricks College. Just a few years before his death, while riding a night train to Rexburg, he composed the words and arranged the music for a school song, "Dear Old Ricks." Oscar Ammon Kirkham , of the First Council of the Seventy and executive secretary of the Y. M. M. I. A. for many years, was born Jan. 22, 1880, in Lehi, Utah, the fourth child of nine born to James Kirkham and Martha Mercer. He was baptized Jan. 1, 1888, and filled a mission to Germany in 1900-1903. Upon his return he married on May 24, 1905 in the Salt Lake Temple Miss Josephine Murdock. She would bless Elder Kirkham with nine children. Elder Kirkham was ordained a Seventy February 26, 1905 by Joseph W. McMurrin. He graduated from the Brigham Young University in Provo, Utah, then studied music in Berlin, Germany and taught school in the Latter-day Saints University. He was Scout Executive of Region 12, Boy Scouts of America. During the International Boy Scout Jamboree, held at Artowe Park, Birkenhead, England, in 1929, he was a member of the national staff, was general morale officer and member of the program committee, and had charge of the religious exercises of the American scouts and assisted in the general supervision of the American contingent. On October 5, 1941 Elder Kirkham was sustained to the First Council of the Seventy at the age of sixty one He was set apart by President Heber J. Grant. In 1953 Elder Kirkham spoke in General Conference of the importance of our youth, "As youth goes, so will civilization go. Thus we must safeguard their future with noble example on the part of worthy parents and leadership, with devoted personal attention, then our civilization will continue to progress." President Kirkham continued to serve in the First Council of the Seventy until his death March 10, 1958 in Salt Lake City, Utah. Sister Kirkham's death was mentioned in the Statistical Report for 1976. Some years later Elder Cree-L Kofford of the Seventy spoke of President Kirkham: "Oscar Kirkham was one of the great men of the Church and among the Church's most respected Scouters. He served in the First Council of the Seventy and was a significant presence wherever he went. Often in meetings he would rise to a "point of personal privilege" and then, when recognized, would proceed to say something good about someone. Near the end of his life, he spoke briefly at Brigham Young University on the theme "say the good word." On the morning that Elder Kirkham died, Elder Marion D. Hanks was invited to the Kirkham family home. There he was handed a small, inexpensive notebook in which Elder Kirkham had kept his notes. The last two entries were: "Say the good word" and "Your name is safe in our home" (see Marion D. Hanks, foreword to Say the Good Word, by Oscar A. Kirkham , p.4). Oscar Ammon Kirkham (January 22, 1880 – March 10, 1958). The title of the book Ida Murdock Kirkham prepared and had published just three months after the death of her husband, President Oscar A. Kirkham of the First Council of the Seventy, is Say the Good Word. It could also be the title of their life story. “Whether in disappointment or widowhood, one must remember to put oneself last and bring joy into the hearts of others. It is the core of the gospel,” explains Sister Kirkham. Her husband died 13 years ago, and she has carried on their tradition of sharing scriptures and inspirational thoughts at every opportunity. Writing a special scripture on a little card and sending it to a friend in need has brought help to many, many people. She is a great and courageous lady who honored her husband’s wishes to “keep the good word alive”; with the help of her daughter, Grace Burbidge, she began the collection of thoughts for the book immediately following President Kirkham’s funeral. Waiting until one feels happier, or is over the grief, isn’t as wise as spreading sunshine, according to Sister Kirkham. “Then you’ll feel some of your own.” And in her recent serious illness, back came the “bread cast upon the water”—flowers, cards, and countless friends. During their life together the Kirkhams were both busy—he the beloved missionary and Scout leader and she a president of the Daughters of Utah Pioneers. She serves still on the DUP advisory board. This common interest in serving and “sharing the good word” bound them together firmly.